Nathan Archer has been the Editorial Cartoonist for the Tallahassee Democrat since 2016. A native of Richmond, Virginia, he’s lived in Tallahassee since 2002 when he came here for graduate school at Florida State University. 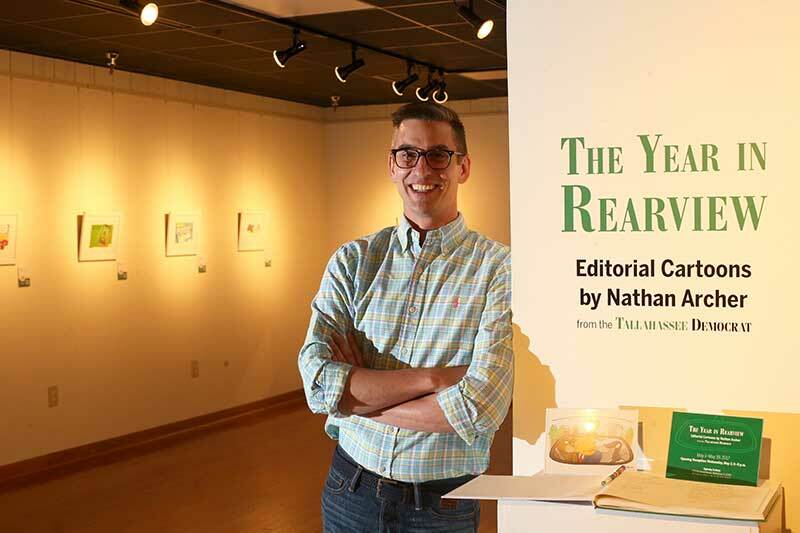 Nathan loves mentoring students, promoting the art of cartooning, and making people laugh wherever he goes. What is necessary for your creative process? Coffee! I need at least 20 oz. of straight black java juice flowing through my veins to get going. What fictional character would you like to bring to life and meet? I’d love to know what Lois Lane thought of my editorial cartoons and if they’d run in the Daily Planet. Music in the car? No time for that! I’m usually listening to WFSU, trying to get a lead on my next cartoon. But if I put something on at home, there’s a good chance it’s either Billy Joel or Supertramp. What is the last book you read that had an impact on you? Cartoon County by Cullen Murphy. Written by the son of Prince Valiant cartoonist, John Cullen Murphy, it’s a look back at an era in which dozens of cartoonists and illustrators lived in a close-knit community in southwest Connecticut. There’s a lot to be learned from those old troublemakers. It’s time for dinner; where are we going to eat? I’m extremely indecisive, so choosing a restaurant is an excruciating process. But let’s flip a coin. Heads, Bird’s Aphrodisiac Oyster Shack; tails, El Cocinero. If you were trapped in a TV show or movie for a month, which would it be? Silliness is in my DNA, so I wouldn’t mind spending some time in the absurd world of Angie Tribeca, my latest binge-worthy guilty pleasure. Flight. It’d be great to soar above the clouds, but the real payoff is skipping those long TSA lines! Cartooning has taught me that if I fail, there’s another opportunity to succeed right around the corner. Just pick yourself up, dust yourself off, and give it another try. What do you hope you will be remembered for? People tell me I smile a lot, so if that’s what I’m remembered for I’d consider it a life well-lived. Visit tallahasseearts.org/artist/nathan-archer to learn more about Nathan and over 950 artists of all creative disciplines in our Artist Directory. Visit TallahasseeArts.org for a complete list of arts and cultural events, public art, arts education, and more on the Tallahassee Arts Guide.